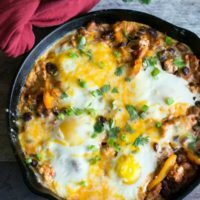 There is nothing more satisfying than a hearty hot breakfast like this easy Ground Turkey Chili Shakshuka recipe. It is warm and full of delicious ground turkey to keep you full all morning. Your whole family will love this ground turkey recipe! Today I wanted to create a fun twist on a shakshuka. In case you haven’t heard of a shakshuka, it is an egg dish where the eggs are poached in a tomato sauce. Shakshuka is popular in the Mediterranean, and the Middle East. 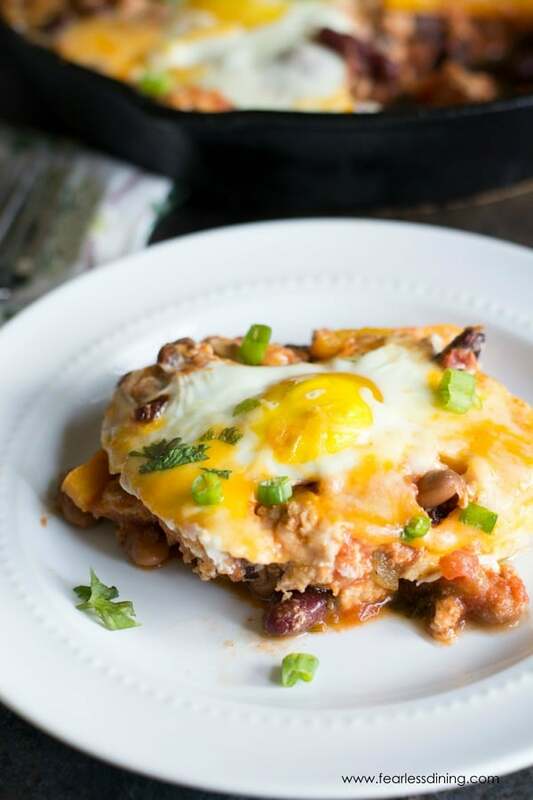 This chili has just enough spice and flavors to blend in with the eggs and cheese to make the perfect breakfast! This high protein breakfast is ready in just 30 minutes. If you love a more traditional shakshuka, this Garden Vegetable Shakshuka recipe is another fun breakfast to try! One thing I love about this recipe is that it can do double duty. 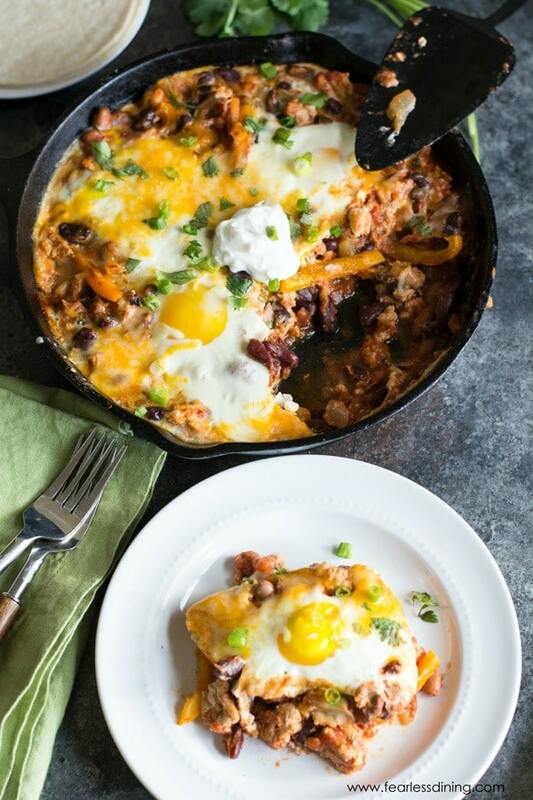 You can make a big pot of turkey chili for one meal, then use the leftover chili to make this delicious breakfast shakshuka. Ground turkey is healthier, leaner, and much lower calorie than ground beef. Using ground turkey instead of ground beef means my chili isn’t greasy! That is a win-win when you have picky eaters! 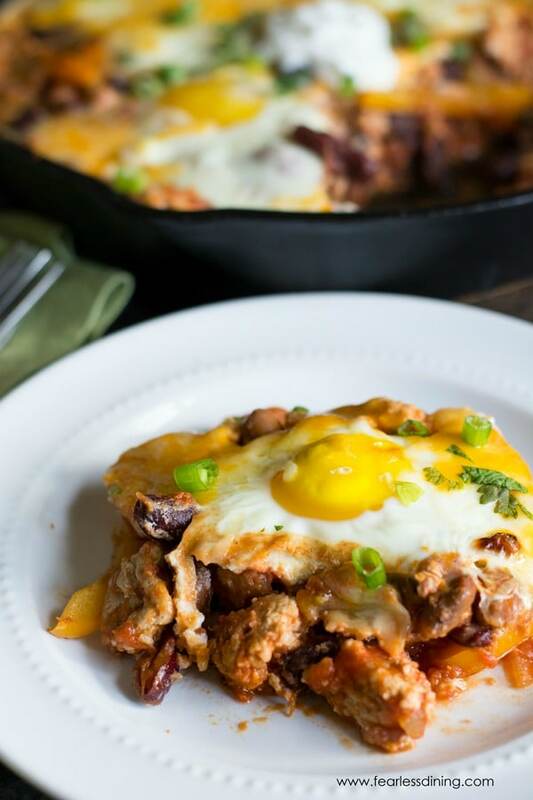 This easy shakshuka recipe is full of protein from the ground turkey and healthy beans! Did you know that Foster Farms is a family-owned and operated? Foster Farms has remained true to the legacy of excellence, honesty, quality, and service established by its founders, Max and Verda Foster. Foster Farms Organic Ground Turkey is grown here in California. Foster Farms Organic Ground Turkey is USDA Certified Organic and raised free-range on organic land with no antibiotics ever. 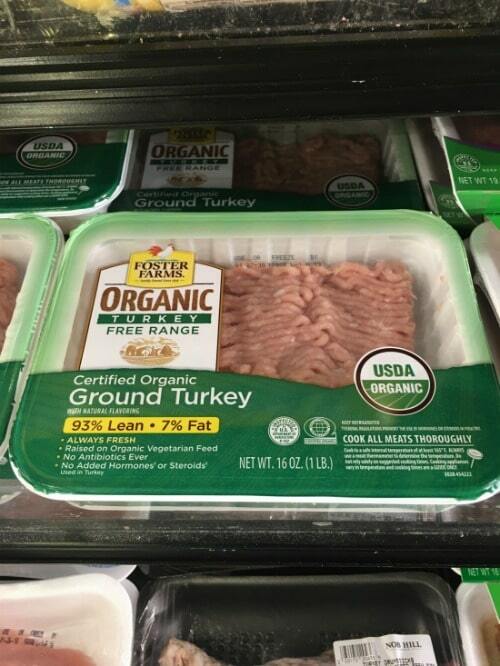 Foster Farms Organic Ground Turkey is 100% natural with no antibiotics, no GMOs, and no added hormones or steroids. This is really important to my family. You are going to love how easy this spicy baked eggs recipe is to make! Are you ready to see how easy this easy shakshuka with meat recipe is to make? The first step is to cook the ground turkey with a little olive oil, onion, and garlic. 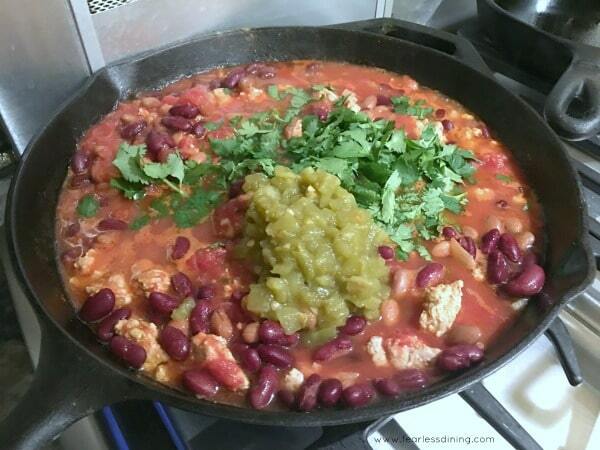 Add in tomatoes, beans, spices, green chilis, and cilantro and simmer. Continue to simmer. 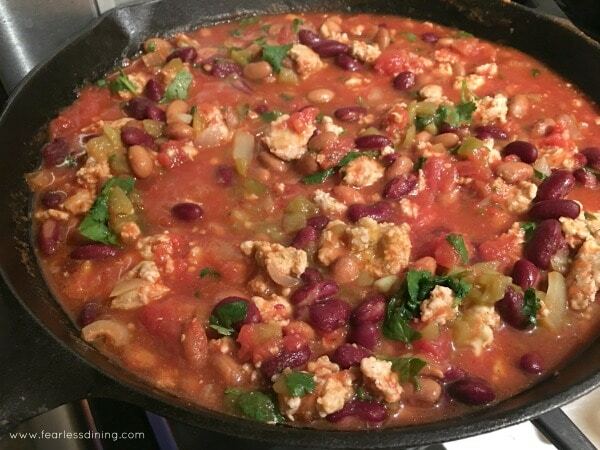 See all of the ground turkey in this chili? I love how hearty it turns out! Now for the fun part…poaching the eggs in the tomato chili. Drop in the raw eggs right into the chili. 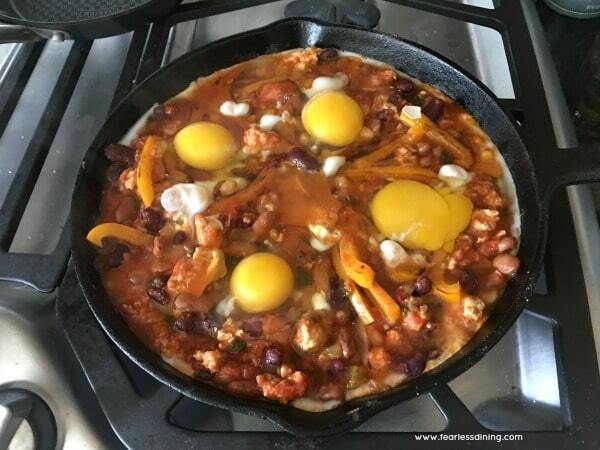 Let the eggs settle into the chili and simmer on medium-low heat. When the eggs are partially cooked, I pop the cast iron skillet under a broiler for 5 minutes. After 2 1/2 minutes, I remove it to add some grated cheddar cheese and fresh chopped cilantro. Serve hot with sour cream, chopped cilantro, and scallions. Like it spicy? Add in some jalapeños! 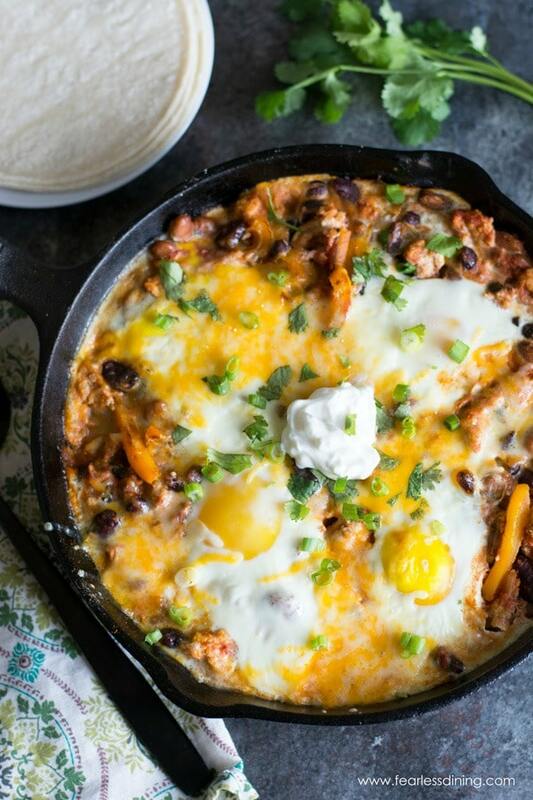 If you love Shakshuka, you may love this Mexican Shakshuka recipe too! A 12″ cast iron skillet. This is perfect for a shakshuka because it can go from stovetop to oven. An easy to use food chopper for the onion and peppers. In a cast iron skillet, add olive oil and allow to heat 1 minute. Add ground turkey, garlic, peppers, green chiles, and diced onion. 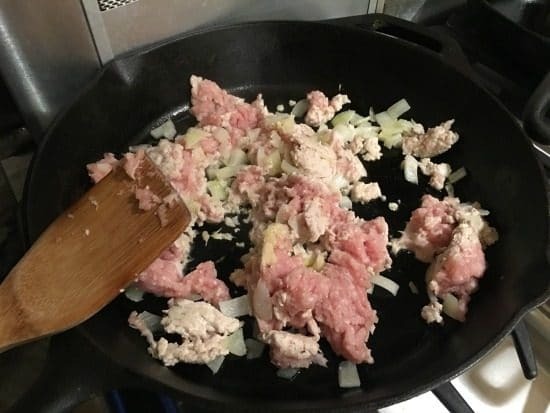 Cook for 5 minutes until onion is soft and ground turkey is cooked. Add spices, tomatoes, beans, and chilis. Bring to a boil. Allow to boil for 3-5 minutes then reduce the heat to simmer. Simmer for 20 minutes. Add 4 raw eggs. Allow eggs to poach in the chili for 5 minutes. Remove the skillet from the heat and put under a broiler for 5 minutes. After 2 1/2 minutes, add grated cheddar and then put back under the broiler for the remaining 2 1/2 minutes. Enjoy hot, garnish with sour cream. I’m making this tonight as it looks delicious + easy. Am I missin something though? I got all of the ingredients today at the store. I’m reading the recipe now before I prep dinner and no where in the ingredient list does it mention green chilies. Also in the directions it doesn’t mention when to add the orange pepper. Just a little confused. I hope with the list leaving out green chilies doesn’t alter the taste of the dish too much. Thank you! Not sure how to rate this so I will change upon response. Hi Amber, I add the peppers and green chiles with the onion and turkey while cooking. I will clarify in the recipe. Thanks for pointing this out!! This is Shakshuka I’m totally going to try. I love how I can make 2 meals with just 1 recipe! 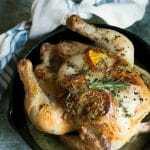 I use Foster Farm poultry all the time also! Made some turkey chili today with it. I love your idea of using the leftovers for a totally different meal. Can’t wait to give your recipe a try, love this spicy deliciousness! This is a great, hearty dish for lunch! 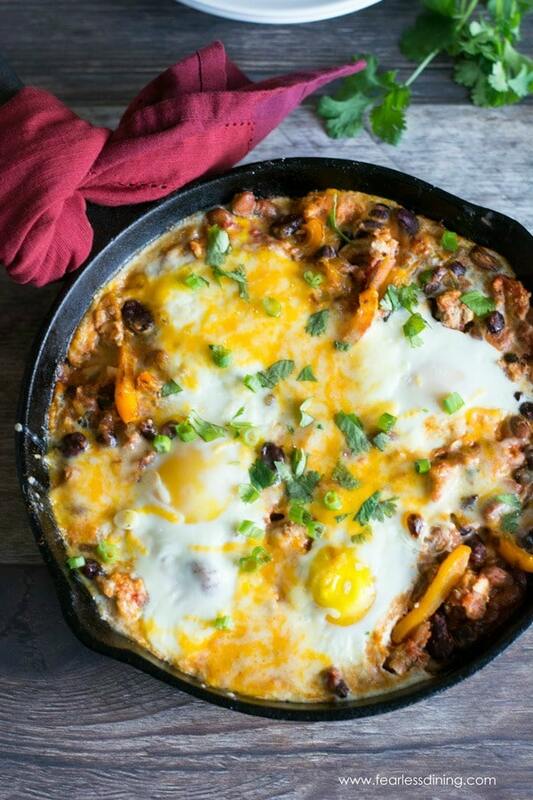 Turkey is one of my biggest protein sources, and this chili shakshuka looks very appealing. I think I should try this recipe, thanks for sharing! I’ve never thought to add turkey to shakshuka or to use chili for that matter. But now I am obsessed with the idea! How yummy and totally satisfying! Now THIS is my kind of breakfast! What a feast! I love ground turkey, as well! Bet it amazing in the beautiful pot of comfort food! I love shakshuka, but I’ve never thought of adding turkey to it. Great way to up the protein! This entire shakshuka looks amazing. I love that you used ground turkey in here. I can’t wait to try this, I know the family will love it! I use ground turkey more often than ground beef and I always look for organic, but I don’t think I’ve seen Foster Farms in my area of South Florida. Do they distribute there? Now about this shakshuka — simply stunning — and you’re planner like me — making chili one night and repurposing it for breakfast the next day. 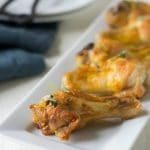 I love these kind of recipes that do double duty!